I visit Cambodia on business trips quite often. Coming from Japan, the local traffic scenes often shock me. The other day, on my way from Phnom Penh Airport to the hotel, a collision occurred before my eyes in which a car rear-ended into a motorbike that had jumped out from an alley. More often than not, incoming motorbikes from the intersecting side roads neglect to check traffic behind them upon entering/merging the flow, which really scares me. Luckily, though, in the city, traffic is often congested and cars aren’t speeding much, so collisions are not likely to turn into serious accidents. The number of traffic-related fatalities in Cambodia (population 13.39 million as of 2008) has been increasing from 1,709 cases in 2010 to 1,893 in 2011 and 1,894 in 2012, creating a big social problem. 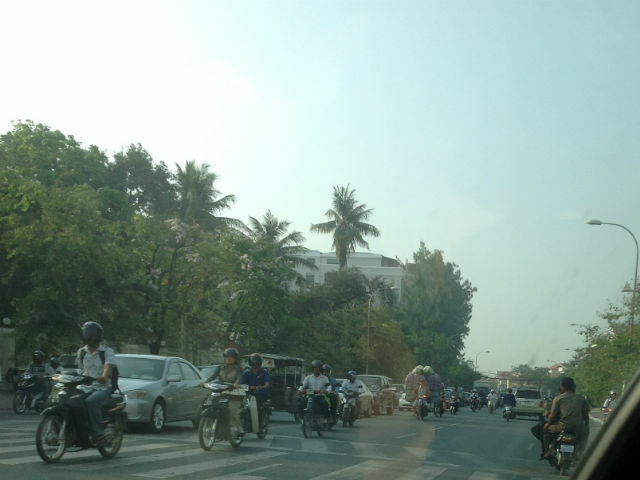 Aside from accidents, dangerous traffic manners also highlight the traffic scenes in Cambodia (as well as in other developing countries). Examples include: sharing a bike ride with three to five people (including babies), removing rear-view mirrors, riding without helmets, cutting off other motorists, driving at night with no headlights on, driving down the wrong way, and riding motorcycles on sidewalks, to name a few. The list has no end. Police keep an eye on major crossroads, but until the driving etiquette and manners change, scenes won’t be much different, I’m afraid. I don’t know what would trigger a change, but until then, at least compulsory helmet use should be enacted.